B Vitamins (thiamine, riboflavin, niacin, pantothenic acid, pyridoxine, biotin, folic acid, cyancobalamin). These support various enzymes that help convert food to energy. B Vitamins serve as co-enzymes that assist in specific metabolic processes to break down fats, amino acids and carbohydrates for energy. Magnesium is essential in all energy dependent reactions that include the use of ATP energy. It serves as a catalyst in the creation of ATP from ADP. It is also a catalyst when ATP is used for energy by helping in the hydrolysis of ATP (the act of releasing the energy stored in the high energy phosphate bond). Copper plays an important role supporting the synthesis of ATP in the mitochondria, or the part of the cell responsible for energy production. Chromium is an essential trace element that is needed for the metabolism of energy. Chromium works with insulin to support the uptake of glucose into our cells. Co Enzyme Q 10 (CoQ10) is a powerful endogenous antioxidant that resides in the mitochondria and is a vital component of the energy producing process of ATP. It eliminates harmful free radicals produced during the ATP process. Ginseng and Rhodiola Rosea are a known adaptogen to support an increase flow of steady energy throughout the day. L-Tartrate-Carnitine increases the rate at which the liver oxidizes fat therefore increasing the amount of energy available. It shuttles long chain fatty acids from the liver into the mitochondria to be metabolized. From weekend warriors to professional athletes, anyone can step up their game with MaxATP. As a pharmacist who enjoys running marathons I was looking for a way to improve my performance. 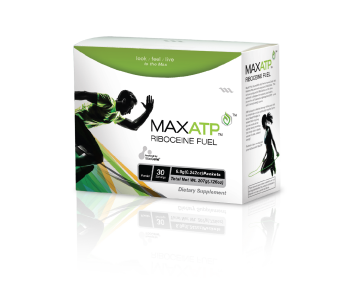 After using ATP, not only have I shaved 40 minutes off my runs, I feel that I have more energy and my recovery time has improved. I can be very active, playing 5-6 softball games in a day and am often gassed by the end of the day. After trying a sample of ATP one day I felt great playing through the entire day.